Claw the System: Poems from the Cat Uprising is a short book filled with luscious cat photos and poems written by extremely upset cats. Cats have a four stage plan for their uprising: recognize, resist, revolt and rebuild. Each stage has a chapter filled with at least ten poems and an equal amount of cat photos. Most of the photos relate directly to their neighboring poem. The photos are, of course, cute. The poems have the snarky feeling that I get off my cats right after I have fed them. 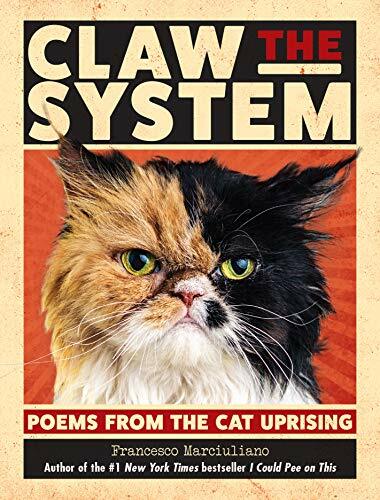 Claw the System: Poems from the Cat Uprising is the perfect gift for the cat person in your life. If you want to scare a first-time cat owner, this would also be a good pick. I think this book is only funny to those who are allowed to live in their house by their furry and purry master. 4 stars! Thanks to Andrews McMeel Publishing and NetGalley for an advanced copy.